The perfect address for lunch or dinner in Méribel Mottaret ! At lunchtime, La Table du Ruitor invites to enjoy its vast terrace, just metres from the Méribel Mottaret ski lifts. In the afternoon, come and taste one of our crepes and have a well- deserved snack°! And at the end of the day, meet up with friends at the bar for a cocktail before dinner. Whether you fancy a Savoyard specialty, a delicious cut of meat from our Argentinean grill or a more refined menu, you will find what satisfies your appetite in a warm, authentic and friendly atmosphere! 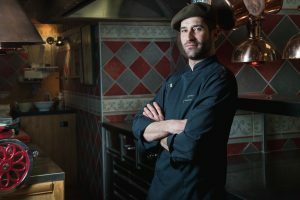 Originally from the Hautes Pyrenees and used to local flavors, Mathieu Canguilhem, a young 35-year-old chef left his hometown, Toulouse, to go and develop his knowledge in well-known places with starred chefs. Always searching for subtle flavors, Mathieu looks forward to the new seasons in order to work on his favorite fresh products. He attaches particular importance to the harmony of flavors as well as precise attitude training of his creations. Mathieu speaks little, but express himself through his cuisine. In love with the mountains, the chef dropped off his bags in the Alps. Established for a few years in Méribel, it regales the customers of the AlpenRuitor. After an exhilarating morning on the slopes, the large sun drenched terrace of La Table du Ruitor is the ideal spot to recharge your batteries ! Treat yourself to our salads, grilled meats, pastas, risottos and mountain specialities, beginning with well-known croziflette ! After a day on the slopes, meet up with family or among friends in our lounge, THE place to meet up in Méribel Mottaret ! While the fire crackles in the fireplace, you can sample our delicious crepes and homemade pies, prepared daily by our pastry chef. Cosy and welcoming restaurant who catered for our vegetarianism. Lovely staff. The menu was rather limited but what they did, they did well. I went here twice after skiing down to Meribel. Outside the area was packed so I sat inside for a meal. The surroundings were excellent including non-clump floors for ski boots!! Toilets were immaculate too. We went there with a group of friend for a kind of apres-ski on our first ski day and it quickly became our base. Everyday at the same kind of time we would get back for appreciating very good Afligem from the tap or very tasty hot wine. The staff was so friendly, nice and very helpful. The wine produce from the restaurant owner's vineyard has been enjoyed by all of us and the fondue was voted hands down the best everyone had ever tried. highly recommended!